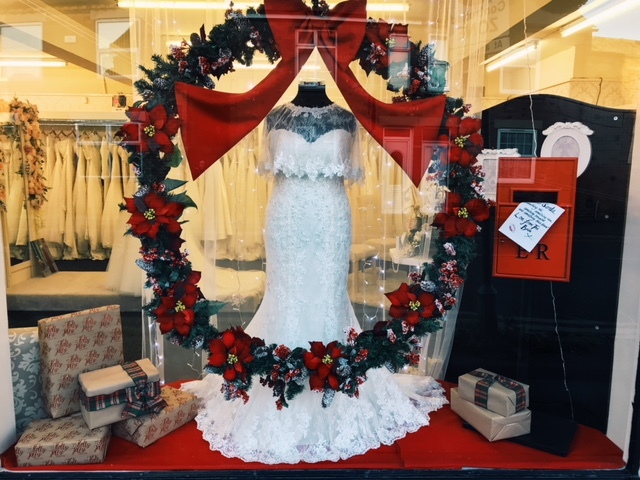 Why not book an appointment now and we'll get back to you with some options for your special wedding dress design consultation..
Christmas Has Come Early In The Boutique Today! This morning we have had a huge delivery of Allure Bridal gowns from their Madison James, Romance and Women collections! With fabulous lace, sparkle and styles, these gowns are not to be missed! All these gowns come in a range of colours and sizes 4-30. Call us today on 01636 640057 to book your appointment before Christmas or the New Year! Just in time for the Newark Christmas Lights Switch on this weekend our Christmas windows are ready! In the window this year we have got two of the gorgeous Spring/Summer 2018 Justin Alexander gowns and also two stunning prom gowns from Mori Lee! It's beginning to look a lot like christmas! We are so excited to finally reveal part of the latest Helen Henderson collection in our photo shoot with Ryan and Latesha from Halls Independent Photography! Halls Independent Photography are a local business who specialise in wedding and portrait photography. Having met Ryan earlier in the year we decided to collaborate on a photo shoot for our latest collection as we knew he would capture the perfect creative images behind the camera! We also worked with local model Tyler Rolfe and this was her first ever photo shoot!! Safe to say she did an amazing job and was a complete natural! Thanks again guys, we look forward to working with you again soon on our next campaign shoot! Every bride deserves the wedding dress they've always dreamed of. At Eternally Yours Bridalwear, we've been creating beautifully crafted Wedding Gowns for over 25 years. Visit our blog regularly to stay up to date with our latest designs, brides and what's new in the world of wedding fashion! Want to share your wedding dress fitting with friends? Why not book one of our luxury dress appointments? You can enjoy all the comforts of our boutique with up to four guests, all to yourself, with champagne & hor d'oeuvres!